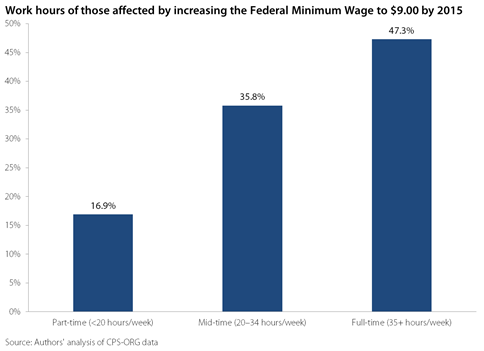 Of the many proposals in Tuesday night’s State of the Union address, the one that seems to be receiving the most attention (especially in the Twitterverse) is President Obama’s plan to raise the federal minimum wage from $7.25 to $9.00 an hour by 2015. The President also called for subsequently indexing the minimum wage to rise automatically each year with the cost of living. Though some states have higher minimums, the federal minimum wage has been set at $7.25 since July 2009. In the meantime, as it always does, inflation has eroded its value. This proposal lays the foundation for an important and overdue conversation about increasing the minimum wage to combat its erosion over the past four and a half decades. We have found that raising the minimum hourly rate to $9.00 by 2015 would directly boost the wages of over 13 million Americans. The increase would also have a spillover effect, bumping up wages for another 4.7 million workers who earn just above minimum wage. The demographic composition of minimum wage workers is often grossly mischaracterized, so let’s take a closer look at exactly who the 18 million workers who would see a raise under the president’s proposal really are. (The 18 million estimate is revised slightly from yesterday’s analysis to reflect improved methodology.) 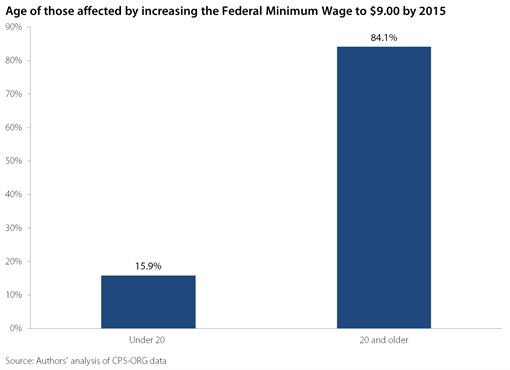 The findings that follow are largely an update to an earlier EPI analysis which was based on the somewhat higher minimum wage increase introduced by Senator Tom Harkin (D-Iowa) and Representative George Miller (D-California) as the Fair Minimum Wage Act of 2012. Though a minimum wage increase would help both men and women, it would disproportionately impact working women. Nearly three-fifths (57.4 percent) of those affected by the President’s proposal would be women. The proposed minimum wage hike would also help workers across all races and ethnicities. Just over half (53.1 percent) of those impacted are white, non-Hispanic workers. A quarter (25.2 percent) are Hispanic, 14.8 percent are non-Hispanic African Americans, and 6.9 percent are Asian or another race. 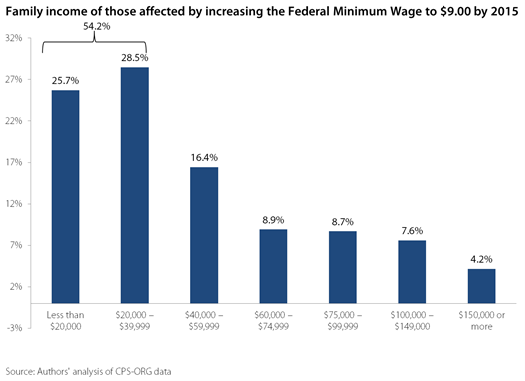 A minimum wage increase to $9.00 would benefit mostly low- to middle-income families. About 70 percent of affected families have a family income less than $60,000. (Median family income was $60,974 in 2011.) Among those that would benefit, over half (54.2 percent) are part of families that earn less than $40,000 per year, and a quarter have an annual family income of less than $20,000. The minimum wage increase will not only help struggling families make ends meet in a difficult economic environment, it will also spur economic growth. Low- to middle-income individuals have a higher “marginal propensity to consume” than high earners, meaning they are more likely to immediately spend any additional pay than other income groups. This will further boost consumption and GDP, which is especially important given that weak consumer demand is the primary constraint in this slow and fragile recovery. It is encouraging that the president realizes the significant positive effects of a long-overdue federal minimum wage increase and that the media is fostering the developing conversation. I am hopeful that Congress will recognize the necessity of raising the minimum wage and enact appropriate legislation in the very near future.